Random new candy purchases can be dangerous. On one hand you could have found a new favorite, on the other you may have wasted money on some sub-par, run-of-the-mill candy that you wouldn’t mind never seeing again. The former was the case when I found these Lindt Fun Eggs. I was prowling around shopping the other weekend and thought I’d check in my local Lindt retail store for some eye candy. I didn’t expect to buy anything, seriously, because Lindt is pretty reliable in regard to releasing the same old classic confections for the holidays from year to year. So you can expect my surprise when I saw these two new filled eggs on display. One with a passion fruit vanilla creme and the other strawberry. What struck me as so new and exotic about these was not only that these were new Easter items, but as far as I know I’ve never even seen these flavors attempted by Lindt before. Luck was surely shining on me. 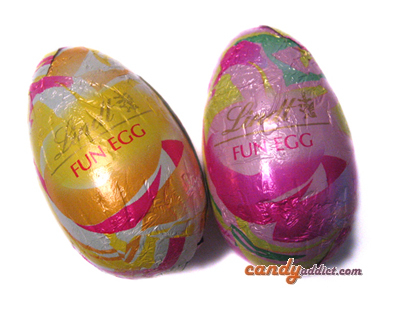 These “Fun Eggs” are about the same size and weight as the Lindors truffles we all know and love. They’re wrapped in foil and decorated in beautiful spring-like colored swirls. One egg has a more yellow themed wrapper, while the other is pink. Aside from the label at the store, there’s no mention as to what the flavors are, so I can only guess that pink is the strawberry one. PassionFruit/Vanilla: Yellow/Orange wrapper: I was immediately surprised when I unwrapped the foil, because this is white chocolate! I was seriously expecting a milk chocolate shell with a flavored creme interior. The white chocolate is specked with blotches of beige all over, giving it a realistic egg look. There are also designs molded on the surface: motifs of spring tulips and flowers. It smells overpoweringly of passion fruit; sweet, tart with its apple/peach/pineapple aroma. I bit into the very top, lightly applying pressure as to not crack the whole egg in my hand. I found the chocolate to be very hard, and when it finally gave way, I had a large stripe of creme center stretching from the egg to my mouth. This is sticky stuff! The flavor seems to be mostly in the white chocolate shell, which has some crunch to it, like little bits of puffed rice (I’m guessing that’s where the uneven surface color comes from). 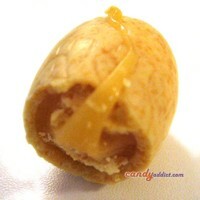 The center is creamy and certainly fruity, but it doesn’t hold a flame to the flavor of the shell. I nibbled away at it, thinking about how this is all very fruit flavored and not very vanilla at all. Then, I hit something in the center of the egg. What’s this, another surprise? In the center/bottom of the egg, there is a lump of vanilla ganache, complete with its signature black flecks. How fun (and delicious) is this? The ganache is a dream, like all of Lindt’s Lindor interiors: sweet and so silky. The flavor is nice too, of very fresh vanilla and it blends beautifully with the creme and shell. Wow. I’m just blown away by this, not only for the flavor but how Lindt managed to create an element of surprise in what seemed to be a fairly standard chocolate easter egg. Strawberry Creme: Pink/Magenta/Yellow wrapper: I’m curious about this one now, considering what a wild ride the passion fruit/vanilla egg was. This is white chocolate as well, and the surface is specked with pink splotches. The surface has the same flowers molded delicately onto the surface. It smells very strongly of fresh strawberries. Yum! I bite into the top again to find a wonderfully fresh flavored white chocolate with little bits of crisp in it. The flavor is so fresh and lovely, and you can tell they used fresh strawberries. Just so good and flavorful. 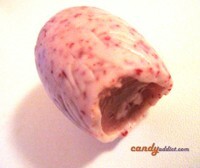 The creme is the same rich texture, but the strawberry flavor is much more tart than the flavor in the shell. It provides a nice contrast. Again, towards the bottom, I hit the same mass of vanilla ganache. Heaven! It’s better paired with the strawberry flavor. And it transports me to a world made of strawberries and cream… heaven. So terribly good. So if you have a Lindt retail store near you, I’d run there fast to see if you can find these yourself! I’m so pleased that my random discovery ended up being something so yummy, but I’m frustrated that these are so hard to find. Let me know if you manage to get some of these yourself! The strawberry one is catching my eye. I love strawberries. Lucky for me I have a store nearby. I will have to make it a point to stop by and get some. This is great! My best friend LOVES Lindt candies…I’ll look for some for her for Easter! Thanks! When I got to the part about the eggs being WHITE chocolate, I actually said aloud “WHAAAAAAAA?” Man, I hope the Easter Bunny brings me some of these! WHOO! I just discovered these yesterday (Sunday) at the Cost Plus World Market here in Tucson and since I love Lindt’s Lindor Balls, and I was in the mood to find something new to try, I found these. OH MY GOD, you are so right on about these eggs, Sera. They are divine gifts from the Easter Lindt Gods! Sigh. I can’t believe today’s review was these! I was so excited about these eggs yesterday that I told a bunch of friends to go buy them (and get me some more while they were at it, LOL)! They have learned to just say, “OK,” and go get the candy and indulge my exuberance about it. Then they thank me for hooking them, too, HA! Great review, really drool-worthy! If I hadn’t already been totally captivated by these, I’d be ready to scour the city to find them based on what you wrote. Trust me, y’all, these ARE THAT GOOD! I agree with most of the review. These eggs were really, really addicting, although mildly expensive. (3 eggs for $2?) I picked ‘em up at the local Lindt retailer shop. As a thought though – I personally thought that most of the flavor of the egg was in the fruit creme in the centre. It wasn’t exactly the shell that had the flavor; I don’t know if they changed the batch, but it seemed like fairly Lindt-ordinary white chocolate with little rice crisps in them. The creme though… I can’t describe how amazing the creme in the centre was. It was so good – incredibly fruity, tart and with a caramel-like mouthfeel. I was mildly wishing that the whole egg was filled with this creme, but the vanilla ganache was rather good, although not as assertive as the white chocolate ganache they put in the Lindor truffles. It was still good though. So, how would I rank these chocolates personally? Pretty good – but hard to find. Be warned. I just love these eggs!! Unfortunately, it’s been a few years since they’ve discontinued them in Canada :( Does anyone know if and where we can still get them now? Pls and thnx.